Hockey New England Junior Convenor Peta Deiderick, left, umpire Harry Lye, Northern Tablelands MP Adam Marshall and Hockey New England President Peter Lye at the Hockey New England Turfs. 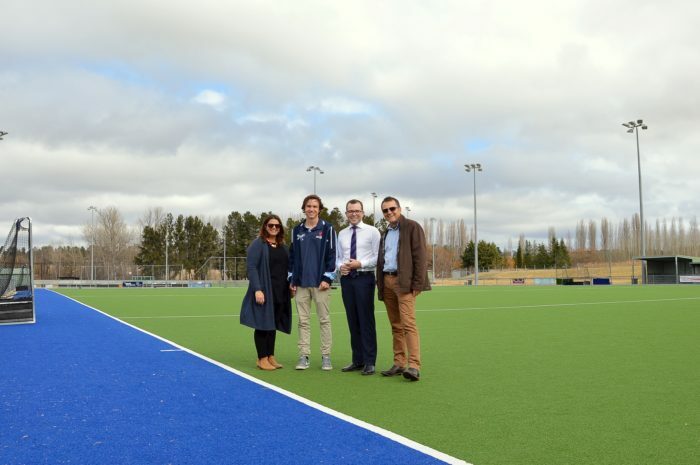 THE region’s young hockey umpires will get a confidence boost in the whistle-blowing world with news of some grant funding delivered by Northern Tablelands MP Adam Marshall. Armidale-based Hockey New England will use a $1,638 NSW Government grant to mentor and guide some of its up and coming junior umpires. Mr Marshall said the association had between 400 and 500 juniors playing in the New England competition and training up and retaining umpires from a young age was critical to the sport. “As in any sport, if you don’t have umpires you can’t play games and Hockey New England recognises that and is out to attract junior players to the umpire ranks,” Mr Marshall said. “Anyone who has ever umpired a sport knows it can be confronting and intimidating, even if you haven’t got supporters on the sidelines who can sometimes be noisy or vocal. “This grant will allow for very young umpires to be supported when they’re umpiring by having older umpires beside them. “The mentors will be mostly teenagers and they’ll be with them to give them more confidence and guide them in the interpretation of rules and hand signals. Hockey New England President Peter Lye said the grant funding was a good win for the sport and he was grateful for the helping hand from the government’s Local Sports program. “Junior hockey is going gangbusters, we’ve got more players and more teams in the Under 9s, Under 11s and Under 13s and we look to use young players a couple of years older than those games to umpire,” Mr Lye said. He said hockey numbers had grown with more school teams as well and junior players coming from areas like Walcha and Guyra to play in the Armidale competition. Mr Lye told Mr Marshall that like all sports attracting umpires could be difficult and many couldn’t find enough people to do the job, especially at senior levels.